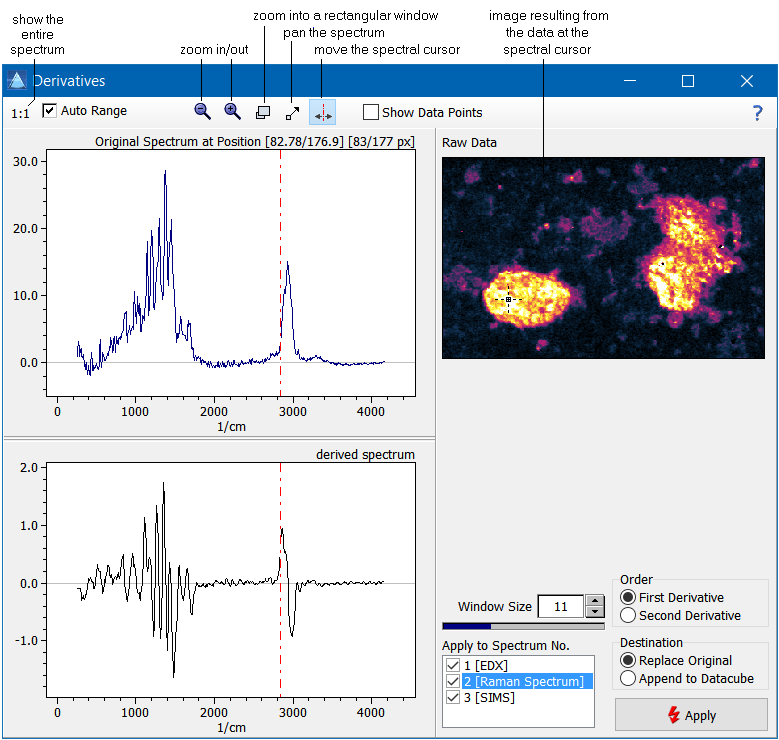 ImageLab allows to calculate the first and second derivatives of the spectra applying the Savitzky-Golay algorithm for smoothed polynomials(1). The user may control the width of the window used for calculating the derivatives. A larger window increases the amount of smoothing of the derivatives. Open the derivative window either by clicking the button or by selecting the menu item "Preprocessing/Derivatives". Adjust the window size to your needs. If the data contain several spectra, tick off the spectra which should be processed. Visually check the results by moving the crosshair in the raw data image at the top right. Finally click the "Apply" button to calculate the derivatives. (1) These algorithms should not be applied to mass spectra, since the implicit assumption when calculating derivatives is a strong correlation of neighboring data points, which is most often not true for mass spectra. (2) Please take into account that a maximum of four different types of spectra can be stored per pixel. Derived spectra appended to the data cube are regarded as an additional kind of spectra.